You guys, I'm about to be an auntie!!! But in all serious, I am so so so excited! And in a few days I'll be traveling to my hometown for my sister's baby shower. Taking a train, all by myself, and spending 3 days, kid-free in and around Toronto. It's going to be amazing. And I absolutely can't wait to celebrate my beautiful sister and soon-to-be-born niece. Which brings me to this post. Lisa is wonderful, and it's no surprise that she has a huge community of people who love her. But with her many social circles and our large family, her baby gift registry has filled up pretty quickly. What a great problem to have, right? 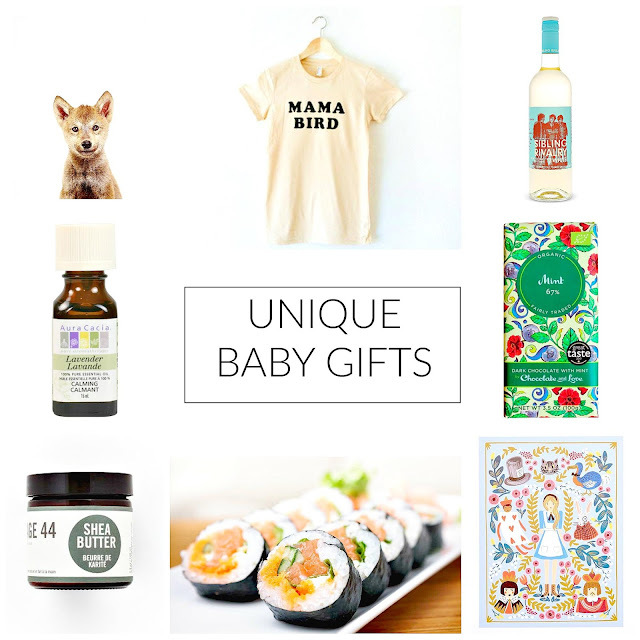 Because I always advocate that you STICK TO THE REGISTRY when buying wedding and baby gifts (because, hello, they are telling you what they need, don't ignore that! ), I've had to think outside the box. And because I estimate that she'll get precisely a hundred and fifty 0-3month outfits, these are not necessarily typical. I'm talking about cute nursery decor (only if you know their style really well!) like these animal prints or these ones from old children's books. Wine and a gift card to sushi - the stuff she's been missing for the last nine months! This cute t-shirt, because she's waited long enough to wear it proudly. Lavender essential oil for her pillow and baby's. The best shea butter for baby eczema/dry skin /cradle cap. Fancy chocolate, because fancy chocolate. ps - I recently read about a bridal shower hostess giving the bride a care package full of stamps, thank-you cards, and envelopes as her gift. How brilliant! Totally could work for a baby shower, too! Thanks for sharing this awesome piece of content with us really loved it. I hope you love to check my blogs too.